Well, Hurricane Michael came through our town and messed things up a bit. By now, we are sure you have seen the pictures. Both the Charisma and Bottom Line were saved, but our office, along with our 2019 calendar, did not fare as well. So, if you have reserved a spot to fish with us this year, please give us a call so we will know you are coming! Our office phone is down, but you can reach Chuck at 850-227-5124 or Betty at 850-227-5646. 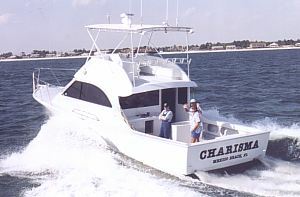 The charter boat "Charisma" is a new custom built, fast, twin diesel powered 43 foot sport fisherman. She is equipped with full electronics, galley, head, bunks and air conditioning for total comfort. She carries a party of six plus crew, with ample fishing room. 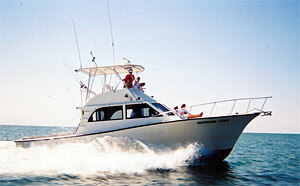 The charter boat "Bottom Line" is a 41' Morgan Custom fisherman with plenty of fishing room. She is equipped with the latest electronics and all the equipment needed to catch that big one. The "Bottom Line" also has dual air conditioning for the bunks and galley for cooling off and relaxing with. A trip with Charisma Charters can be a business situation, a family outing, or a real fisherman's chance to catch that big one. Trips for four or eight hours are inshore trolling for kings, Spanish, blues, blue dolphin, little tuna, ling (or cobia), and some light tackle fishing on our man-made reefs or sunken boats. Off-shore fishing is 12 hours for grouper and snapper. Longer trips are also available. All fishing licenses, tackle and equipment are furnished. You bring only your food and drink. Reservations are accepted by calling (850) 648-8211. Evenings are the best time to call. A $100 deposit will confirm your reservation. Credit Cards are not accepted. A 10% gratuity for the mate/deckhand is requested. So come on down, join the fun, and relax for some fine fishing. Charisma Charters can provide you and your family and friends with great fishing, plus the knowledge that you will be in safe hands with a good captain, on good boats, in some of the prettiest and most productive waters in the world. Dive trips available to special dive sites. $ Call for details.